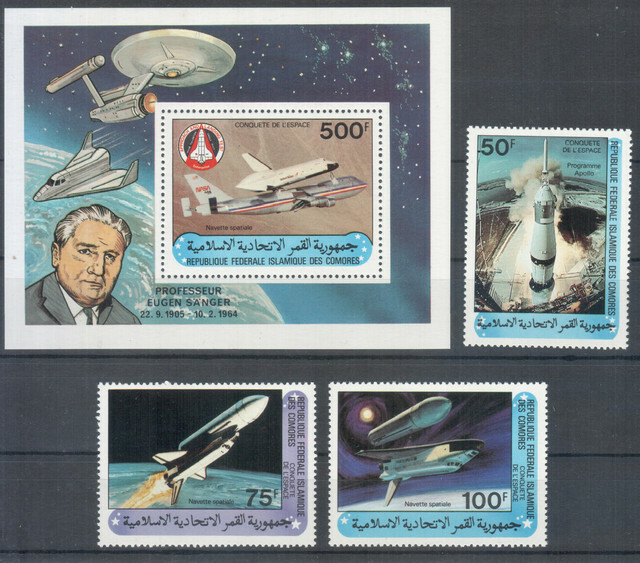 - honoring the 50th anniversary of "Star Trek," as well as featuring NASA's New Horizons mission and the moon. 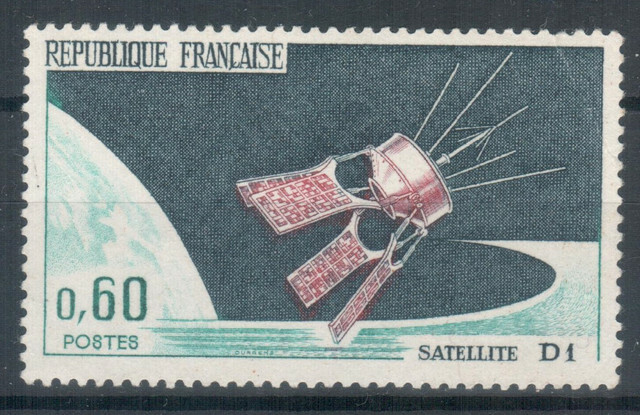 Wallis et Futuna, strip for the 1st French satellite in orbit. YT #PA25A, from 1966. 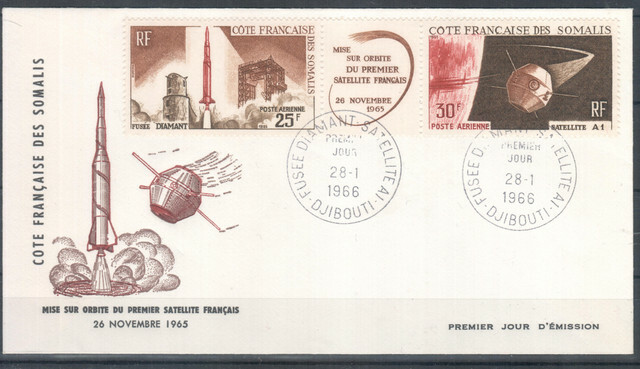 Same topic and design, different French Territory: Reunion YT#369A. 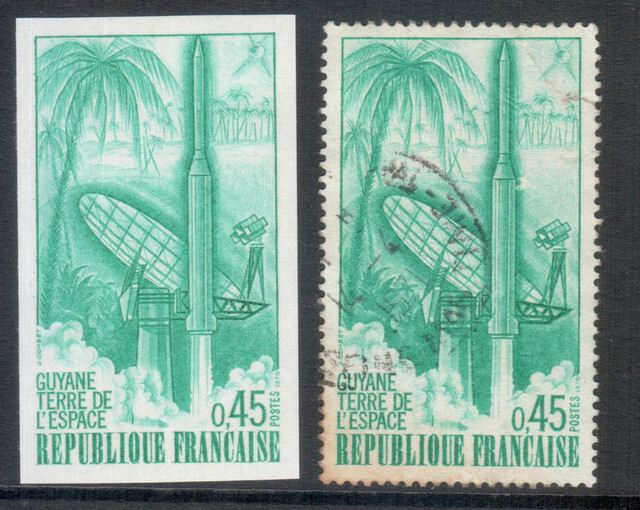 France YT#1635 (imperforate and perforated issues) for the Kourou Space Center in French Guyana, for the launching of the "Diamant" rocket featured in the colonial series. 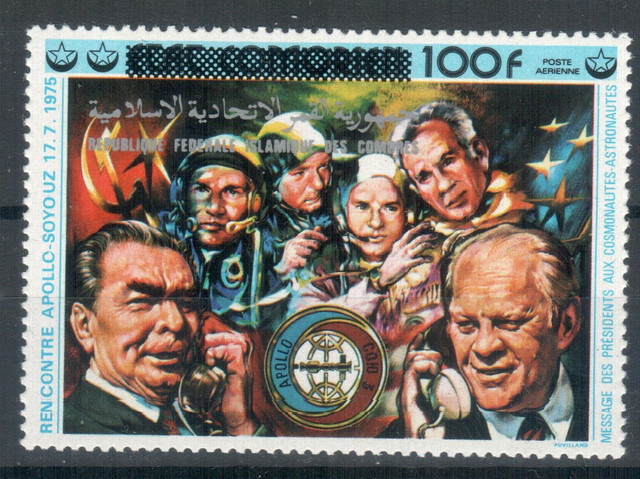 Issued in 1970. 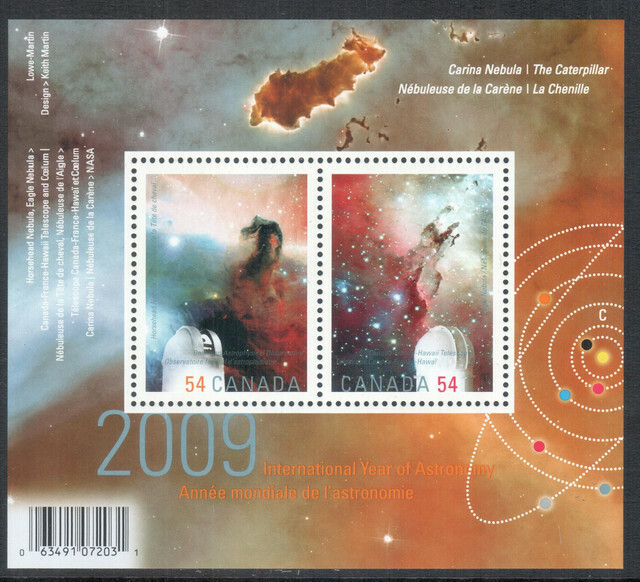 Also found in my Canadian stockbook, this nice astronomy block (SC #2323 from 2009). 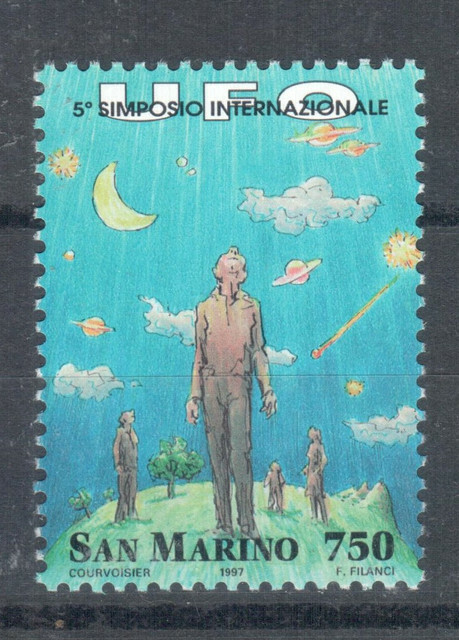 On a slightly humorous note, a San Marino issue (AFA #1683, from 1997) commemorating their yearly UFOlogy Conference. 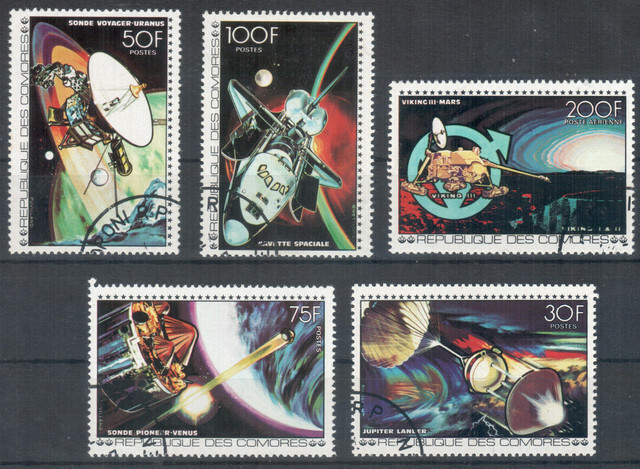 My favourite space theme on stamps: the Northern (and Southern) lights. 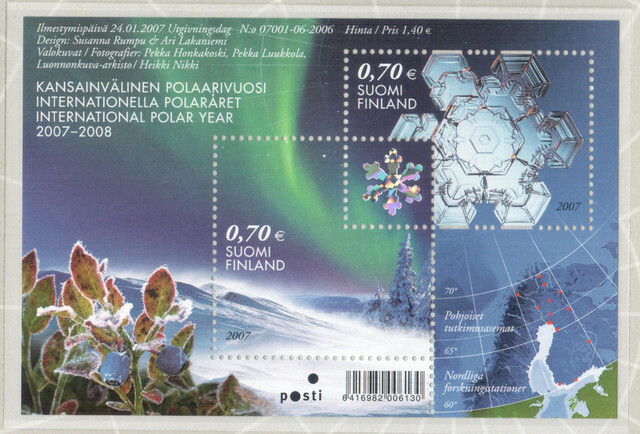 Here displayed in the Finland bloc for the 2007 International Polar Year. 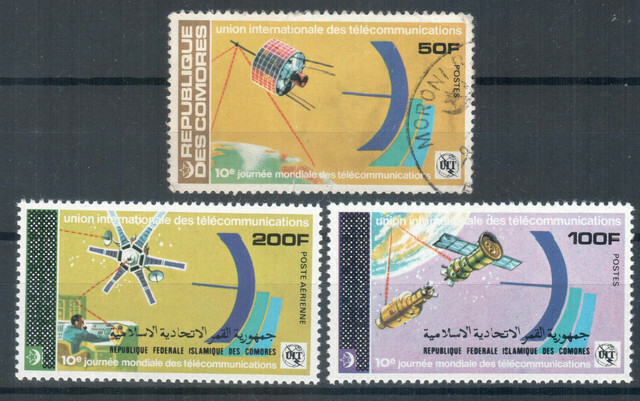 FDC of the Somali Coast issue for the A1 satellite launch. 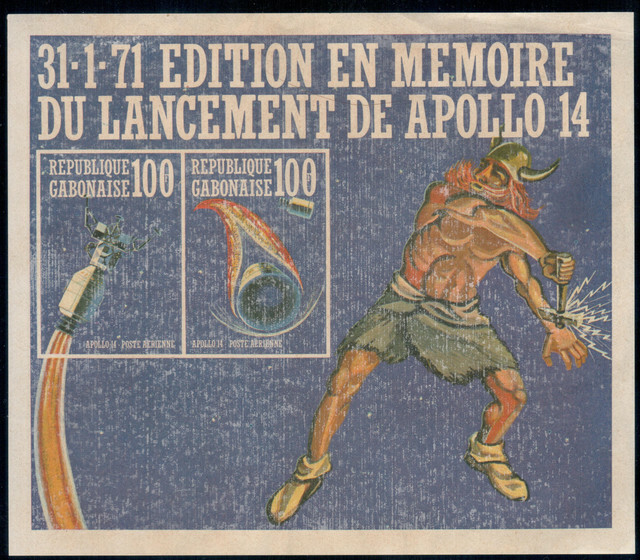 Note that while the original French issue was issued on November 30th, 1965, this one only came out two months later, on 28 January 1966. 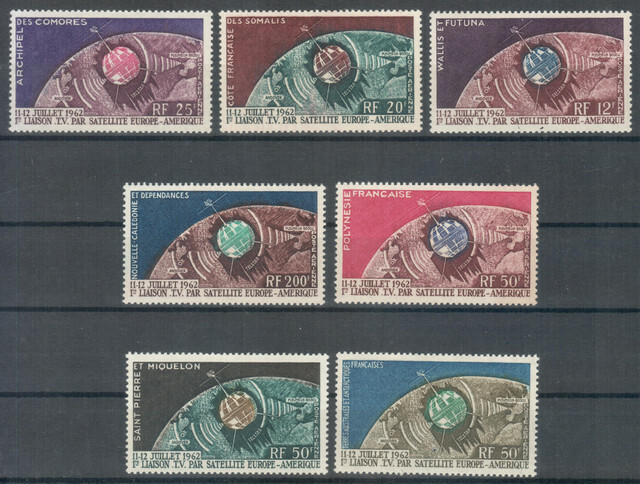 With Hungary once a part of the Soviet bloc, they issued a lot of stamps of Russian history. 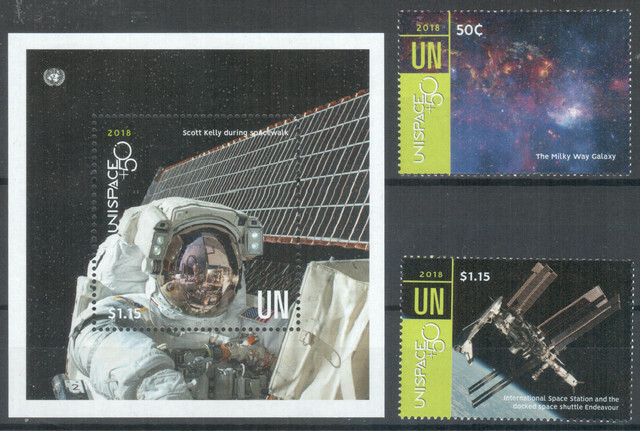 Here is a pair celebrating the first man in space, Yuri Gagrin. Yuri A. Gagarin Cosmonaut Training Centre Tupolev 154 taking off from CFB Trenton airfield on an "Open Skies" flight. 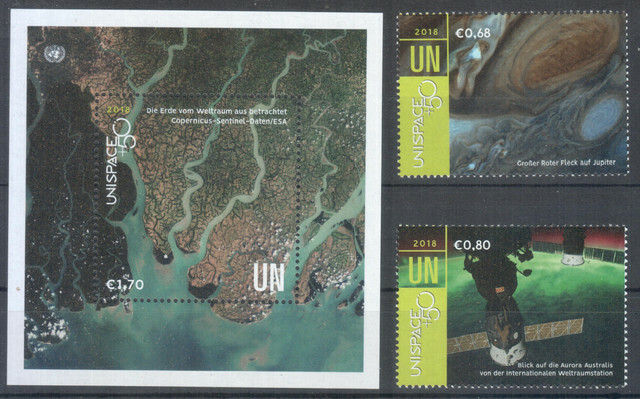 Here is another issue from Hungary. 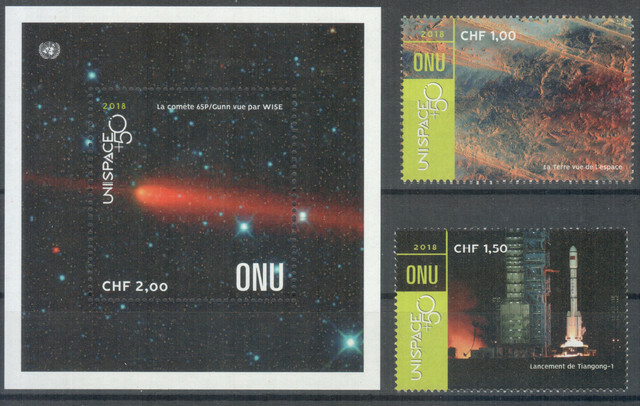 On September 24, 1959 Hungary issued a stamp of the earlier 1959 type, overprinted in red, to commemorate the September 14th landing of Lunik 2 on the moon (Scott 1262). 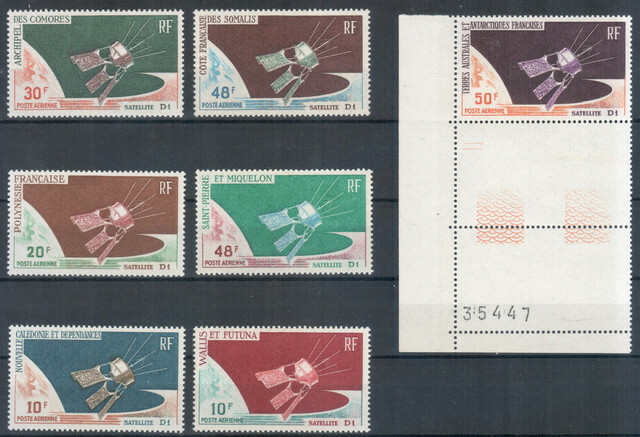 On September 4, 1962 Hungary issued two stamps to commemorate the first group space flights of Vostoks 3 and 4 from August 11 to 15, 1962. 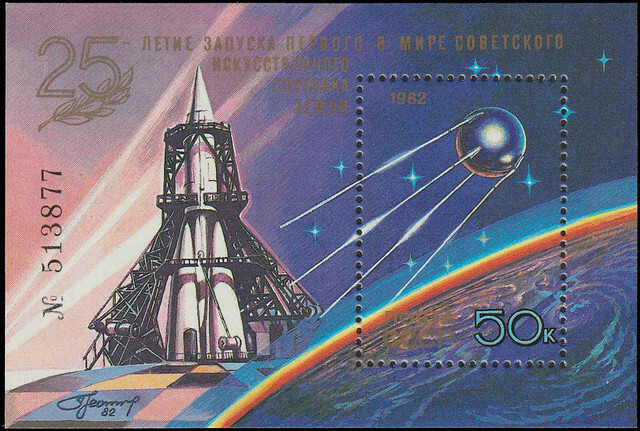 The 1fo stamp depicts Earth, TV screens and rockets (Scott C219) and the 2fo stamp features Adrian G. Nikolayev, Pavel R. Popovich and rockets (Scott C220). 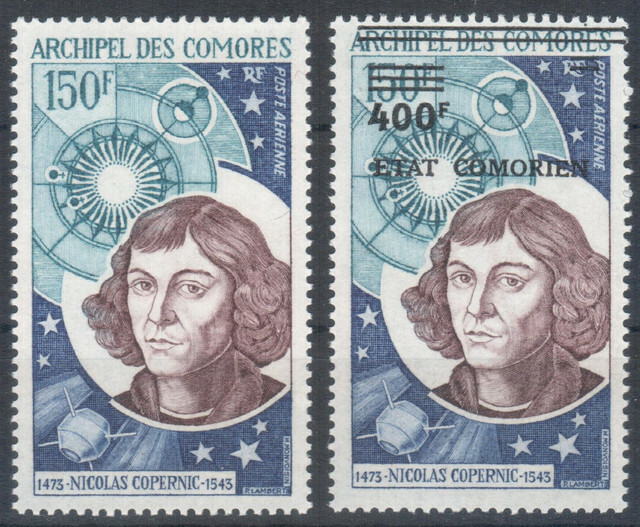 The stamps were printed in alternating horizontal rows and they also exist imperf. 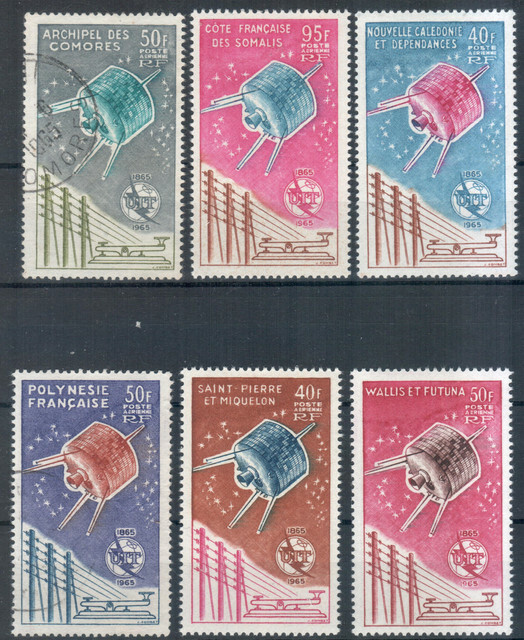 I was able to add these stamps to my collection thanks to a generous giveaway offered by Bombadil . 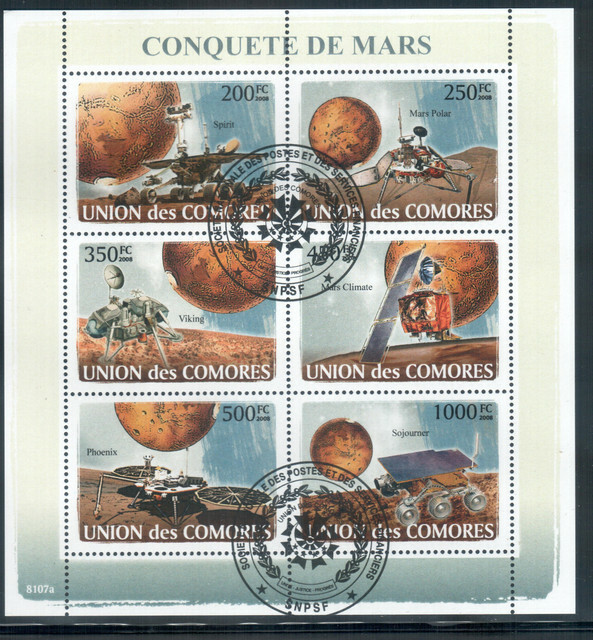 A Comoro Islands issue set with accompanying block about the conquest of space. 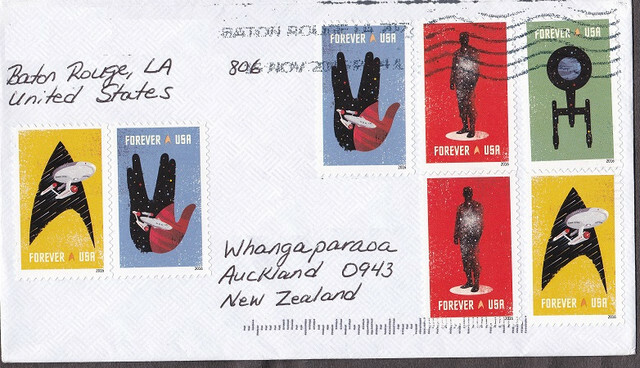 Note the appearance of the USS Enterprise from Star Trek on the block!